Deep beneath the bank of a Scottish loch, one hundred men, women and children are beginning a new life. An outpost for the remnants of humanity, their mission is simple: to survive in a world rendered uninhabitable by a giant asteroid. Safe from the poisoned world above, they begin their task with vigour. But they are blissfully unaware of the terrifying danger that lurks below. Six weeks after the world ended, the survivors aboard cruise ship Spirit of Arcadia have installed a small contingent of skilled individuals and families in a Royal Navy bunker. More than just a backup plan for the human race, these volunteers must realise an essential goal. They are to find a way to provide food and fuel for themselves, and for the three thousand other survivors who will one day return in the ship. Brimming with hope and enthusiasm, the new community is raring to make a start. But their new home is not all it seems, and beneath them, a terrible danger is awakening. 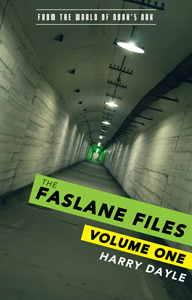 The Faslane Files: Volume One is the first in an exciting new series set in the world of Noah’s Ark. It can be read stand-alone. but is best enjoyed after reading the first two books in the Noah’s Ark series (Survivors, and Contagion).